Monopartite, linear, dsDNA genome of about 200 kb. The genome contains terminal and internal reiterated sequences. 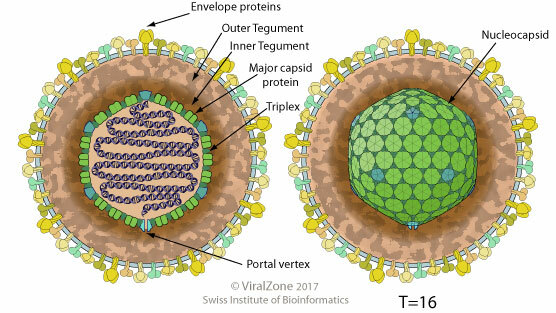 Occasionally, the viral genome can be integrated in host chromosome thereby creating a latent virus. CELL TROPISM HHV-6: T cells, B cells, natural killer (NK) cells, Monocytes-macrophages, epithelial cells and nerve cells. The HHV-6 U24 protein downregulates the T-cell receptor complex and impairs T-cell activation. The UL24 protein homolog induces a cell cycle arrest at G2/M transition through inactivation of the host cyclinB/cdc2 complex . HHV-6 protein IE1 interferes with the binding of IRF3 to the IFN-beta promoter, reduces levels of dimerized IRF3 and nucleus-translocated IRF3 in response to activation by TBK1. This inhibiton of the pathway through IRF3 subsequenty prevents the expression IFN-beta. HHV-6 UL42 modulates the host mRNA expression by exporting unspliced mRNA, thereby inducing alternative splicing .